Saxifrage’s literal big swim was indeed a huge physical feat: a wetsuit-free eight-kilometer crossing between Cortes and Quadra Islands, during which a swim cap, neoprene leggings (worn on her arms where she feels the cold the most), and lanolin-coated skin were her only protection. With her husband Barry in a boat at her side, she completed the swim in three hours and forty minutes. When she landed on the shores of Quadra, a friend’s mother declared, “You looked just like an ocean baby being born.” Indeed, Saxifrage belongs in the sea as much as in the Cascade Mountains of Washington State or Mount Albert Edward on Vancouver Island. The Big Swim captured my heart and brought me along on each of Saxifrage’s journeys with intense and savored delight. 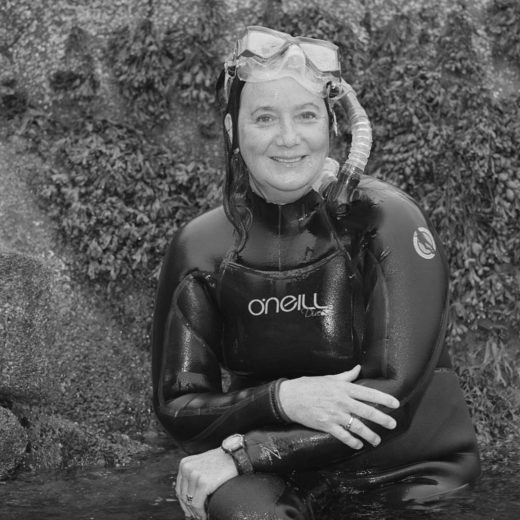 Cite this Article: Diana Hayes “Book Review: The Big Swim,” Hakai Magazine, Jul 31, 2015, accessed April 25th, 2019, https://www.hakaimagazine.com/article-short/book-review-big-swim/.